Note that this brokerage is no longer accepting US clients. Also visitors with US IP addresses may be redirected to the educational non-broker portal. TradeviewForex is a forex broker. Tradeview Forex offers the M4, MT5 and cTrader forex online trading top platforms. TradeviewForex.com offers over 25 forex pairs, gold, silver, stocks, option, indices, commodities and CFDs for your personal investment and trading options. Dec 14, 2017 - 1 Star I am trading with some others PrimeXM Brokers, but TradeView has the highest StopHunting spikes mostly every day! You can check it with our own eyes. Darwinex, Varianse and many others are PrimeXM Brokers and haven't this huge spikes! Thank you for your post! You claim that our SWAPS are too high but can you please specify which currency pairs you are referring too? Also, what do you mean by "stop hunting spikes"? Please explain how this works and if you can provide us with an example because I believe there is some confusion here so I would like to maybe explain this situation to all FPA viewers, including yourself! It will be the second post. I thought the trade environment is the best. I do not do EA or scalping. ILC account. There is nothing to slip and make a promise to say at all. I thought it was the best trade environment. I think that it is the best environment for those who do scalping. Regarding withdrawal, I used bit wallet. Today I withdrew within 10 hours. Last time I withdrew money soon. As for withdrawal, I think that it is considerably earlier. I have not used bank remittance yet. However, until the arrival of money it may take time due to the circumstances of the bank and the circumstances of the bit wallet, but the processing up to that point is done quickly. In other words, I think the withdrawal process itself is done quickly. I thought it was really the best dealer. These are my subjectivity. Please make your final judgment on your own. Also, if there is any change in the trading environment, if there is a problem, I will list it. However, I believe this broker is all right. It is the best broker. Dec 29, 2018 - 5 Stars I had to suspend my account for a while, but I restarted the trade again. Chat support was the best response, all handled quickly. We also immediately responded to anxiety about deposits and withdrawals. I think that it is a wonderful Excellent vendor. Actually use it, I will make a contract with almost no slip. It is the best trade environment for day traders like me. I will not use EA. I do not know because I do not play ping, so I do not know Ping is a sophisticated technique, it does not suit me. However, I think that the person who scalping is also the best environment. The dealer is friendly and really gentle correspondence. I pray for prosperity of this supplier. Please judge all things by yourself at the end. I have been trading with TradeView for a few months now. I am very happy with them as they offer tight spreads and also the option of using the best platform to me which is CTrader. But their biggest asset is their customer service. If you have the chance to work and get your account managed by Michael Turk, you guys are going to be lucky. I have seen a lot of great reviews at first and few scam alert that put a doubt in my mind. Now that I am with them, let me tell you that all scam reviews are huge BS. This broker is everything but a scam. I would strongly recommend this broker to any trader at any level. TVmarkets manipulate the spread to whatever they want...in this case 20 pips ! I am a three year experienced trader with 1000s of live trades behind me...technical, pattern PA trader GU EU oil ...TVmarkets modis operandum is to manipulate their Mt4 spreads against the trade to whatever they want it to be....on Thursady 22nd Nov i was trading GBPUSD, i was on a roll growing my account by 50% in a day. WHam GU started dropping 8pm....so i hedged...the fee jumped from a 0,5 pip spread to a 20 pip spread!!!!! i have screenshots showing that even in the money, the loss on trade is 24 GBP on 0.2 LOT ! So i asked support on chat NOT to close my trades but to cancel my three trades AS IF THEY HAD NEVER EXISITED....i specifically said : Do NOT close my trades, as i can merely do that myself:....well they immediately closed my three trades, two buys with a TP...which three hours later it reached and a sell trade which a day later went into 140 pip profit...all three closed me out losing half my profit for the day ! This is Michael Turck, the Head of Sales here at Tradeview. I am really confused by your post. I would like to go on the record to say that your post and review is completely false and inaccurate by all accounts. We offer some of the tightest spreads in the market place and only charge a commission of $5 round turn per lot, for our iLC style trading accounts. We certainly DO NOT manipulate the spreads at all and we do not even add a markup to our spreads, as some other brokers do. You are claiming that the spread jumped 20 pips on November 22nd. You claim you have screen shots but I have yet to see them sir! We DO NOT close trades for clients. You might have been liquidated, but you have not provided me with specific ticket numbers for our team to properly review your trades. We cannot CANCEL trades as if they never existed, it is simply against regulations . So, in order for us to properly investigate your issues, be much more specific. Provide me with trading ticket numbers, the date and time of the trades, which pairs, and the exact issue that you think occurred. If you provide me with this information , I will conduct a thorough investigation into this matter and provide you with a detailed report for you to review. I apologize that you are not having a great experience with Tradeview ; as thousands upon thousands of other clients are enjoying their trading experience with us but I can assure you that if we are at fault, you will be fully compensated for any losses that you incurred! I sent my documents to www.tradeviewforex.com the day 12/10/2018 to open a real account and then I received an automatic email saying that they had received my documents and that they were going to answer me, but I still have not received any answer (today is 19/10/2018). I sent several emails to tradeview@tradeviewforex.com and they did not answer me. I wrote too in the web chat of www.tradeviewforex.com and they told me by chat that they were going to answer to me the same day, that was 17/19/2018 and I still do not receive any email answer. 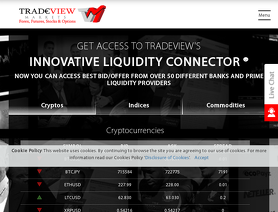 Now I am wondering who has received my documents in www.tradeviewforex.com and if this broker is legal or is a SCAM. I have not paid money yet and I do not know why they want received personal documents if any person can not open a real account. I thought that the web www.tradingview.com was directly related to this www.tradeviewforex.com, but I do not know for sure, I hope someone can clarify it to me. In this forum I see many positive stars but it may be a FAKE, because I am not received any answered by customer service of tradeviewforex. My experience with this broker is bad and I hope, please, that any person can clarify me if this broker is a SCAM and if these WEBSITES are ALL from the same broker or not. I have been trading with TradeView for a few months now and after my old broker stopped accepting Canadian clients. I am very happy with them as they offer stable trading environment, tight spreads and great customer service. Michael Turk has been fantastic to deal with. I would recommend this broker to any trader. I have been very happy with the customer service from Michael Turck and execution of trades. Spread is really tight; especially useful for scalpers. Withdrawals requests are done online without hassle and promptly received with no issues. I've been very happy with my move to Tradeview, tight spreads, great execution, 1:400 leverage and many options to fund. I havent withdrawn yet but customer service is fantastic, their COO Mr Sadgrove even helped me with a question I had. That tells me a lot. Best execution rate, no slippage and/or manipulation. I am an old trader and I used their CT platform since 2016. Withdrawal requests fast and simple (through their website form). **I switched to Tradeview when US brookers became so highly regulated with deminished customer service to client..so glad i did!.. 3)..compatible with my preferred platform/matrix(FxST-FxPM)! 4)..easy and fast access to broker \MICHAEL TURCK\via phone, email,whatsapp! 5)..customer service oriented brooker-problems addressed in timely manner!